We all like it, aren’t we? 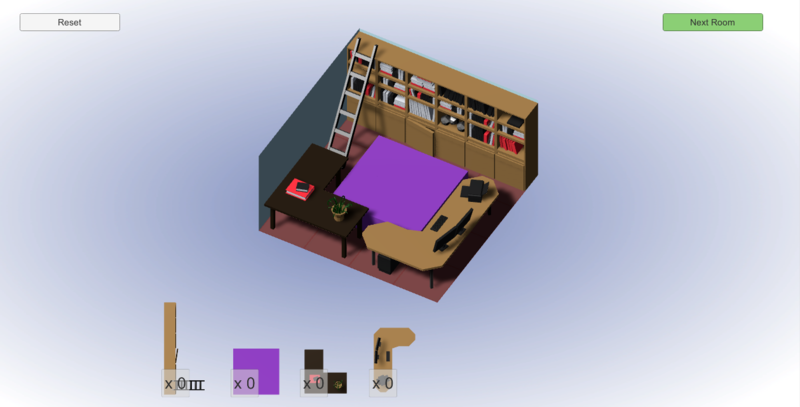 Hey, do you like low-poly furniture in your isometric room? Even with purple placeholder blocks in the middle? Our LD37 advance so far! Hello everybody! A long night awaits for us here in Argentina, but we are very optimistic and full of energy! Our Ludum Dare #37 entry is getting in shape! It’s an arcadey-2D-top shooter-heist-thingy! This is a quick mockup, we already have the character animations and now we are adding details. How are you doing? Well the game jam variety, but in the compo form as usual! Veteran (but still awful) LD’er I return to make yet another game that isn’t really a game (usually leads to some reviews that don’t understand why I have no ‘real’ gameplay). I made the graphics look a bit nicer and worked mostly on the presentation today in the morning. Yesterday I got three and a half levels done as well as the base engine. Not sure how much I can get done, but my goal right now is to make it at least feel like a game from start to finish, which is why I’m currently doing polishing work. Essentially you just use the left and right mouse buttons. Got some basics for the game engine down. Place holder graphics for now. (Except for the pot. I stupidly spent too much time on shading it.) This plant grows and it is controlled with only two buttons. Looking forward to sharing more. Calling it a night, have the initial direction set. Going for broke and trying to do both themes. That said, I’m focusing on Two Button Controls first. I plan on going very literal with it and have only two buttons, either the left/right mouse or left/right edge of a phone/tablet. For my initial idea I really needed it to be in 3D for it to make sense. So my goal for tonight was to see if I could establish a proper scene. Creating 3D assets, especially humanoids, from scratch is a big weakness of mine. I’m satisfied with what I have, so I’ll work on the core mechanic tomorrow. Testing custom engine for the first time; not working perfectly, but not as bad as the last time. Integration with Box2D. Tons of stupid issues to resolve. Good lesson. Loading level from .png files. Not sure what’s going to be dropped. I guess it’s the music and more polished assets again. Hey people, thought I would do that cool “Here’s my progress so far” post. This is a screenshot of Captain BearBeard, our entry for the Jam. Basically you’re a peaceful bear that seeks a honeypot in a ship full of nasty pirates that want to kill you. See the small parrot up here ? He probably is the most difficult enemy to handle. But you don’t fight like a regular bear. You fight by bouncing with your big belly. Because, well… it’s unconventional. Currently the game runs well, the gameplay mechanics are ready and tested. I hope it won’t feel laggy once uploaded on the web (it’s a Flash game). You can already see some features are missing, and the scene feels quite lonely. Soon the bear and pirates will be animated, and the user interface ready. Good luck to everyone, and may your game be as cool as you want it to be ! 28 queries executed in 0.126 seconds.